﻿ News Bharati - From Rajiv Gandhi to Rahul, read how Congress tails Muslim women into animal existence..! News Bharati - From Rajiv Gandhi to Rahul, read how Congress tails Muslim women into animal existence..! From Rajiv Gandhi to Rahul, read how Congress tails Muslim women into animal existence..! New Delhi, February 8: “The AICC President Rahul Gandhi and his coterie, while addressing a minority convention promised to withdraw the Bill pending in the Parliament, penalising Triple Talaq. History has repeated itself, neither as a satire nor as a tragedy. It has repeated itself with a mindset of cruelty”, alleged Finance Minister Arun Jaitley in a blog post on Friday alleging that Gandhi's promise to withdraw the Triple Talaq Bill to win the elections was a repetition of history. “Votes are important, so is fairness. Political opportunists only look at the next day’s Headlines. Nation-builders look at the next Century”, he alleged further. If Triple Talaq had not been a permitted mode of divorce in India. The Supreme Court has already declared instant talaq as unconstitutional and yet in the absence of a deterrent it can at best amount to a civil wrong with no penal consequences. A number of Muslim men and conservatives are choosing to even ignore the Supreme Court judgment. Some incidents are so unconscionable and repulsive that they shake the conscience of the society and compel it to take remedial measures. Injustice perpetuated by personal laws is a glaring example of this. The object and direction of the changes brought in various personal laws have been that gender equality is ensured, rights of women and children are protected and the right to live with dignity is ensured. 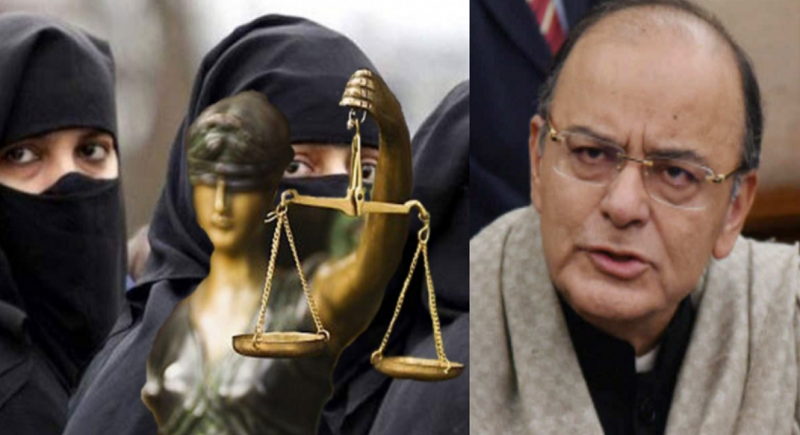 Referring to a recent case from Bareilly, Jaitley said that it relates to the unpleasant practice of Nikah-halala in Islamic personal law. A lady who is married in 2009 was twice divorced by her husband through Triple Talaq, once in 2011 and subsequently in 2017. The family prevailed upon the husband to accept her back. On both occasions, she was sedated and asked to undergo, Nikah-halala, on the first occasion with her father-in-law and on the subsequent occasion with her brother-in-law. “That in the 21st Century there could be such gross violation of the dignity of women in the world’s largest democracy should make every head hang in shame. Both the father-in-law and brother-in-law used the weapon of Triple Talaq to divorce the lady victim so that she could be accepted by her husband”, he added shockingly. The late Rajiv Gandhi committed a monumental mistake in legislatively overturning the Shah Bano judgment of the Supreme Court which guaranteed maintenance to all muslim women. He allowed deserted women to be driven to poverty and destitution. Thirty-two years later his son has taken another retrograde step to drive them not merely into destitution but also to live a life which is an antithesis of human existence. The Muslim woman in Bareilly has been forced into animal existence, he signed off.